(1+.013)*sqrt(6.9)=2.6609, earth-surface pot. energy is 6.9×10^-10 which is velocity squared and 0.013 is 1.3% of surface-pot energy coming from earth-spin. 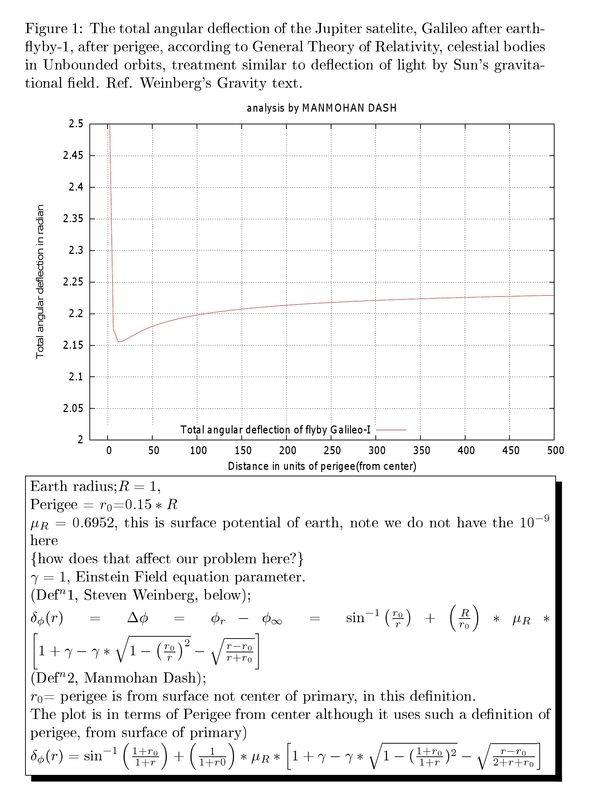 Then you observe 2.66 mm/s at perigee which is very close to earth surface (956 kms is 15% of earth radii, h=0.15) SO now you know beta=10^-5 will produce 1 mm/s. 3.92 mm/s is what you observe at infinite distance. Is it because speed of satelite which is still 13.7 km/s, beta ~ 4.57×10^-5. SO (1+0.013)*sqrt(4.57)/2=1.083 mm/s. SO at infinity: 2.66+1.083=3.743 mm/s. Then you think: it’s still not 3.92. SO we add the speed effect of speed at perigee which is 8.949 km/s which is beta=2.983×10^-5. SO this is 0.86 at perigee (not exactly because the satelite has an inclination towards radar) This makes the perigee increament to be 2.66+.86=3.52 mm/s at perigee. So what is happening? If you are smart you notice that some beta_square are divided by 2 and some are not. In-fact all should be. So let’s divide 2.66 by 2. that becomes 1.33. Then add .86, this becomes: 2.19 at perigee. and 1.33+1.083=2.413 mm/s at infinity. But at any point there are angular considerations and there are relative sign differences between general relativity, special relativity and earth spin. SO I have made a detailed functional behavior of time dilation where you can manipulate the relative sign differences and angular effects. 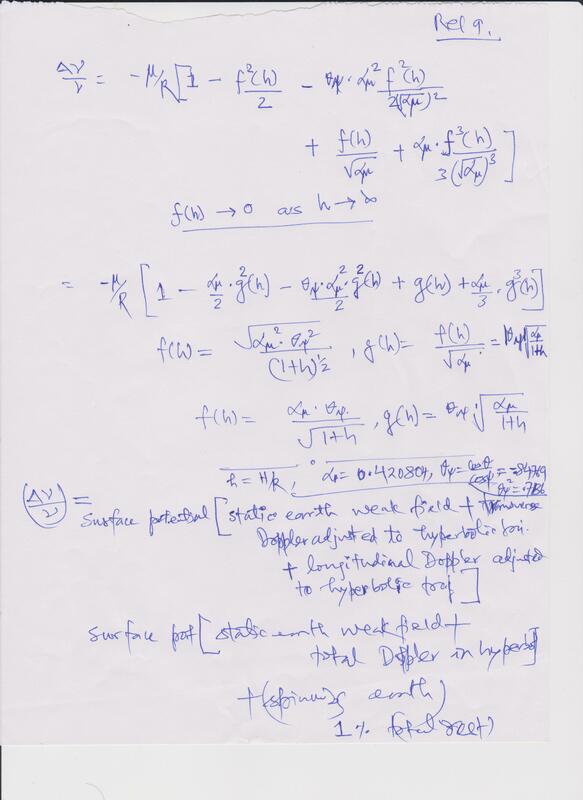 This is a staggering 50 or 60 pages of calculations I did in the last week and can not show you all the functions I plotted using gnuplot because I just installed and do not know all the technical nitty gritties, at-least my system is windows 2007 hence my setting a postscript hasn’t worked so far on my cygwin X11. I will keep trying … till we have a final word on this.